Alberta's biggest industry is looking for ways to thrive in a low carbon economy. In a packed conference hall in Red Deer, Alberta, this past spring, Jason Kenney, a veteran federal politician aspiring to become premier of his home province, made the case for more oil sands growth against a backdrop of increasingly skeptical investors. The International Energy Agency projects growing global demand for oil and gas for the next 25 years, Kenney said during a speech at the first policy convention for the United Conservative Party, which he hopes to lead to victory in a 2019 provincial election. If Kenney wins next year’s provincial election, his efforts to insulate the industry from change will be a political decision. CEOs and politicians around the world are grappling with the need to transition to less-polluting fuels while also taking advantage of the growth opportunities presented by a low carbon economy. Some, like Kenney, are making less ambitious bets than others, predicting a steady business as usual approach for the industry at least for the next two decades. But change appears to be coming fast to the sands. In the months prior to his speech, several major financial institutions like HSBC distanced themselves from the sector. It was the first sign that the rise in investment funds that shun the most carbon-intensive companies was going to have some kind of impact on one of Canada’s biggest industries. Will the trend gain steam? When would it get too big to ignore? 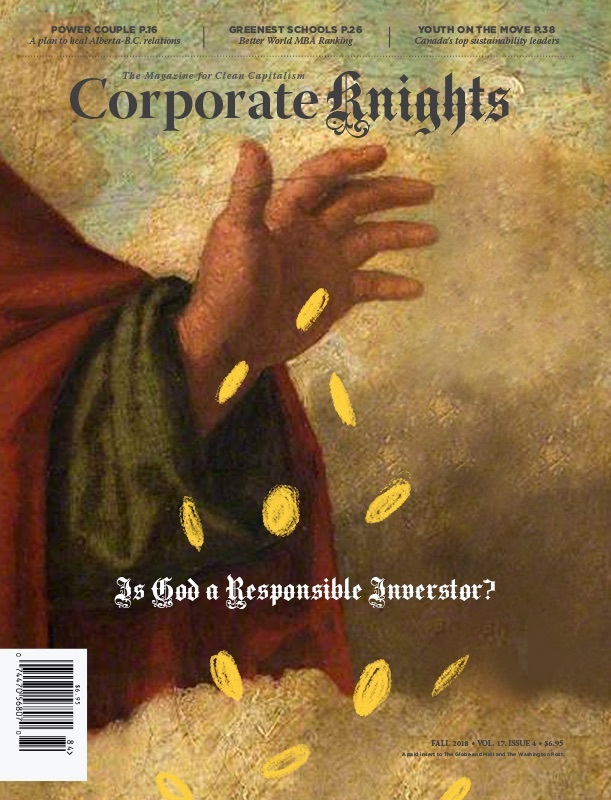 Are big institutional investors walking away because they have a better read on the investment future, or are they trying to appease a passing fancy of ethically minded shareholders? Alberta’s potential green future lies somewhere in the answers to these questions. As Kenney vows to protect the oil sands and, in his opinion, Alberta, from criticism as a matter of economic survival, some industry players and experts say it is well past time to start taking a greener future seriously. With so many variables in play, Alberta should be having a straight and honest debate about taking a different path now, they say. The oil sands are an economic behemoth that has almost always had its environmental impacts in the spotlight. Occupying three distinct regions across northern Alberta, the sands produced 2.7 million barrels of crude a day in 2017, about 64 per cent of total Canadian production. Around 149,300 people work in the province’s oil and gas production market, which includes conventional oil sources. The oil sands are extracted either by mining, which represents about 45 per cent of production, or in situ, which involves injecting steam into the ground to push the petroleum out. Mining requires opening large tracts of the Earth’s surface to remove the sands, which the Canadian Association of Petroleum Producers says takes place over an area about 900-square kilometres. To make crude oil, the product has to be heavily processed and often diluted to ease transportation. An engineering feat, the work that goes into making oil from the sands demands a lot of energy, which puts the sector in the crosshairs of local and international environmental groups. While the condemnation has always been plentiful, a new breed of critic began to emerge in recent years as climate change, caused by human beings increasing the amount of carbon dioxide and other heat-trapping gases in the atmosphere, climbed to the top of global concerns. Keeping the worst ravages of climate change at bay would mean keeping fossil fuels in the ground, the criticism went. Projects that would otherwise be considered economical could become “stranded assets” – to use a term made popular by Bank of England Governor Mark Carney – because of the gradual increase in emissions rules and growing concern for climate change. Many major financial institutions have since agreed. In October 2017, French bank BNP Paribas, which had assets under management (AUM) of €560 billion, said it would no longer do business with companies focused on the tar sands, another term for oil sands. The vow, which included promises to support cleaner energy companies, also swore the company off oil sands pipelines. Two months later, AXA, a global insurer with €759 billion in AUM, announced plans to divest from its portfolio €700 million in oil sands producers and pipelines. It also said it would stop insuring oil sands projects. In April, London-based global bank HSBC announced it would not provide financial services for new oil sands mining and in situ projects, a move that earned a rebuke from Kenney and oil sands producer Suncor, which promptly cut ties with the major bank. Suncor and HSBC had announced new work together as recently as November 2017 when HSBC Securities helped manage a Suncor financing arrangement. As interest in oil sands divestment grows, investment funds that exclude or minimize fossil fuels have also increased in number. Europe’s largest asset manager, Amundi, currently holds US$5 billion in “decarbonized portfolios,” a growing figure, according to the group. Canada’s second largest pension fund, the Caisse de dépôt et placement du Québec, has promised to increase low carbon investments to $24 billion by 2020, just two years from now. Around 1,000 institutional investors with US$6.24 trillion in assets are currently committed to divesting from fossil fuels, according to Arabella Advisors, a U.S. group that tracks divestment. A major incentive for financial institutions to pull polluting companies out of their portfolios is because the exposure of certain assets to the impacts of climate change and new cleaner technologies will shrink their value over time. The impact of the shift to low carbon investing will be felt by companies in natural resources and energy production, and companies will have a range of reactions, BlackRock Canada managing director Marcia Moffat told a recent Toronto conference. “There will be companies who are recognizing that there is a larger natural incentive to a more carbon resilient economy and they are investing for that future,” said Moffat, whose group has $111.7 billion in AUM in Canada. Growth in the oil sands sector isn’t projected to be as high as it has been in the past, Scotia Capital oil and gas analyst Jason Bouvier said, creating an incentive for companies to explore new business models. Since the early 2000s, the industry was often adding 220,000 barrels a day to production each year, Bouvier said. The industry will likely see growth in the 50,000 to 60,000 barrel range for the foreseeable future, he said. Companies can boast of some major projects coming into operation in 2018, such as Suncor’s Fort Hills facility, but those were planned many years ago. Significant new major projects aren’t expected in the near term, Bouvier said. The oil sands haven’t been waiting for a shove from mostly European banks to clean up. Low oil prices have forced energy companies around the world to become much more efficient in recent years, according to analysts and executives interviewed for this story. Some firms, such as Royal Dutch Shell, forecast prices to stay low for a long time. The oil sands have also had to deal with domestic political pressure, namely the arrival of provincial and national carbon pricing. In 2012, oil sands companies representing 90 per cent of production set up COSIA, an organization that allows them to share proprietary information and collaborate on pollution-reducing projects. The companies have put $1.4 billion into 981 projects over the past six years, but measuring the amount of emissions the projects have reduced is outside COSIA’s mandate, chief executive Dan Wicklum said. “If, when, how those companies implement the technologies is frankly an independent business decision,” Wicklum said. COSIA is more of a hub where the companies meet to decide what ideas they’ll try out, he said. COSIA does measure the number of times a company decides to use a technology developed through the hub, a figure that currently stands at around 400, Wicklum said. One key player at COSIA is CNRL, a large oil sands company with a market cap of $45.6 billion as of mid-October. It owns two major oil sands mines and upgraders north of Fort McMurray. The Calgary company is trying lots of approaches to bring down emissions: capturing and storing carbon dioxide during production, storing carbon dioxide into mine tailings and making mining operations more compact and more mobile. Some of that work is paying off, the company said. CNRL has seen a 24 per cent decrease in greenhouse gas emissions at its Horizon Oil Sands facility over the past five years and 10 per cent since 2016, said its vice-president of technology and innovation, Joy Romero. But the figure to pay closer attention to is the emissions intensity of a barrel of oil, which indicates how much in greenhouse gases is released per barrel of oil. As environmental regulations and climate-aware financiers bare down on the oil sands, this is the statistic that shows how the industry stacks up against global competitors. Currently, the oil sands are a little under five per cent over the emissions intensity average for global crude oil, Romero said, and getting better. “We’re on a very clear path to be below that average as a group for oil sands,” she said. That’s a matter of debate. A team of two dozen scientists published a comparison of oil production greenhouse gas intensity from across 90 countries in the journal Science in August. The average intensity across the countries was 10.3 grams of carbon dioxide equivalent per megajoule. Canada – which placed fourth highest in emissions intensity behind Algeria, Venezuela and Cameroon – had an intensity of 17.6 grams of carbon dioxide equivalent per megajoule. There are different ways to measure emissions intensity. The scientists only looked at emissions from extraction to upgrading and refining because they wanted a clearer comparison of how clean different energy producers are. Companies like CNRL use a wells-to-wheels comparison, which looks at how polluting a crude would be from the moment it’s extracted to the second its fumes come out of a tailpipe. A September report by energy analysts IHS Markit, which, like the researchers who published in Science, looked at emissions from extraction and production but not combustion, found the oil sands’ intensity could fall 16 to 23 per cent by 2030. The Pembina Institute, an Albertan energy and environment think-tank, uses an analysis that includes combustion. It argues companies will have a harder time making progress than they claim. “It’s true that they’re working very hard, but most of the technologies that are coming through are technologies that will bring only marginal gains in (emission reductions),” Pembina senior analyst Benjamin Israel said. Game-changing new methods will most likely apply to new oil sands operations, while the National Energy Board predicts most future growth will come from expansions of existing facilities, where dramatic shifts are harder to put in place, Israel said. he industry has other options besides making a cleaner barrel of oil. Over the past year, a provincially funded office called Alberta Innovates, which has an annual budget of $286 million that it spends on spurring the creation of new industries, looked at new potential ways to make money from bitumen, the petroleum ingredient found in the oil sands. Alberta has 165 million barrels of bitumen in the ground as of 2016, with unofficial estimates climbing as high as two trillion barrels. The study, known as Bitumen Beyond Combustion, gave a reasonably positive outlook for bitumen-based materials that are expected to see demand growth over the period until 2030, a time when demand for crude oil will grow at a slower rate than it has over the past decade. Chief among those materials are carbon fibres derived from bitumen. Carbon fibre is a fast-growing product that is both strong and light. Currently, the industry is growing at a compound annual growth rate of more than 10 per cent. Already in use in products like cars, the bitumen study found that future growth would be underpinned on carbon fibres replacing steel, cement and wood – and that bitumen-made carbon fibres could also find a market by being mixed with those materials. If carbon fibres took just one per cent of the global steel market by 2030, that would require 3 million barrels of bitumen a day, the study found. Most carbon fibre today isn’t made from bitumen, but the research showed that it’s possible. The missing piece for prospective businesses lies in transforming bitumen into a material that can readily be used in carbon fibre manufacturing, said Ed Brost, an associate at the Bowman Centre for Sustainable Energy in Sarnia, Ontario, who contributed to the study. Oil sands are heavier than other types of crude because of the bitumen, also called asphalt or pitch, in the average barrel. That’s a disadvantage in a world that’s regulating energy production for carbon emissions, but a huge advantage in carbon fibre production because it would be the key material in a manufacturing process, Brost said. Another avenue could be asphalt for roads. The market, currently US$50 billion in value globally, is expected to grow 4.1 per cent until 2030, the Bitumen Beyond Combustion report said. The oil sands already produce road asphalt for western Canada. The trouble with expanding into new markets is that it needs to be kept very hot for transport, as high as 150 degrees Celsius. But if the process of turning the material into pellets can be made cheaper, oil sands-sourced asphalt would fulfil large demand in China, said Nathan Ashcroft, an engineer with Stantec who worked on the study. Getting oil sands-derived asphalt onto international markets in five years is within reach, he said. Markets for carbon fibres mixed with other materials like concrete, which offer an opening for bitumen as a feedstock, will become widespread within the 10- to 20-year timeframe, said engineer Axel Meisen, who also worked on the study. 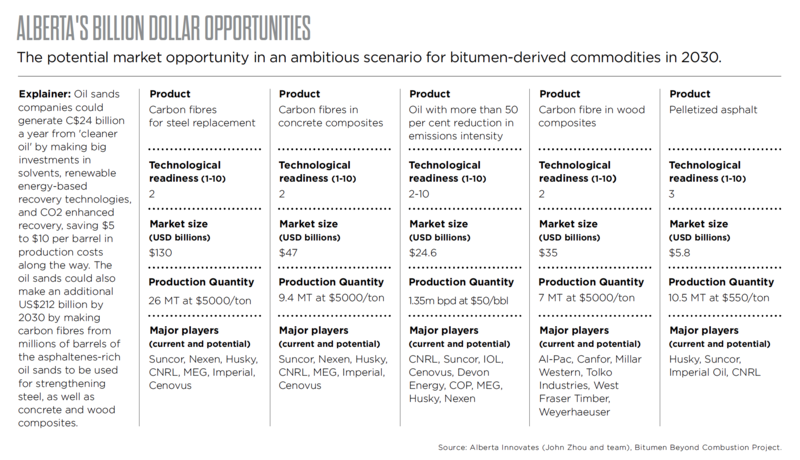 The Bitumen Beyond Combustion project also recommended the oil sands take advantage of massive projected growth in vanadium, which is used in batteries, and try and find a way into the market for plastics, which is set to grow to a trillion dollars by 2030. The project is entering its most crucial stage over the fall. Alberta Innovates will give $2 million over two years to projects that can take some of the possibilities described in the report and bring them closer to commercialization. The key to surviving in a carbon-constrained economy, according to Lambert, is to think about commodities differently than in the past. Companies need to be focused on finding many different uses for a commodity at once rather than rely on one process. “More value creation is the definition of success, not just bigger production volumes,” Lambert said. Aside from the Bitumen Beyond Combustion program, the Alberta government announced in December 2017 that it would spend $1.4-billion over seven years to support low carbon innovation in the oil sands and elsewhere in the provincial economy. il companies around the world are also investing in low carbon energy, an area whose profits oil sands companies could find enticing. Currently, global oil and gas majors own less than two per cent of the world’s wind and solar photovoltaic facilities, consultancy Wood Mackenzie says. But the case to jump in further is increasingly compelling, with solar costs estimated to fall by 60 per cent between 2015 and 2025 and wind falling by 50 per cent over that same period, the group says. TransAlta Renewables may be Canada’s best-known fossil fuel-to-renewables transition story. Originally a part of storied Alberta utility TransAlta, the renewables branch was spun-out in 2013 and has performed startlingly well since. The company has tripled in value since its IPO and now has a market capitalization of $2.7 billion, almost a third larger than TransAlta, which owns 64 per cent of the rising star. Enbridge, once known for its major oil and gas pipelines, has ventured in and out of renewables in recent years. But in 2017 the company bought natural gas distributor Spectra Energy for $37 billion, forcing it to focus on reducing debt. The company defended the recent sale of wind farm assets, saying its deepening position in natural gas – cleaner than oil but still a contributor to climate change – demonstrates its commitment to a low carbon transition. Globally, European firms Neste and Orsted are showing there are profits in going head-long into renewables. Neste, once strictly an oil and gas refiner from Finland, now earns 25 per cent of its annual US$11.7 billion in revenues from refining biofuels, which are made from plants rather than petroleum. The company has generated a return of 328 per cent over five years in September 2018, outpacing the S&P Global Oil index – an energy industry benchmark with 120 oil and gas firms listed – which had a return of 7.25 per cent. The company is aiming to go even further, with sales of renewable diesel increasing from 25 per cent of total sales in 2017 to 50 per cent by 2020. Orsted is a former Danish oil, gas and coal company that has grown increasingly bullish on renewables, offshore wind in particular. Orsted invested 21 per cent of its cash into renewables in 2006 and puts 83 per cent of it into clean power today. Over the same period, it has doubled its operating profit to $4.58 billion and quadrupled its return on capital employed, the company says. Shell Canada, which owns 10 per cent of the Athabasca oil sands mine, sees a growing business model built on renewables, as do Neste and Orsted, but it isn’t moving to change quite as fast. “If you want to be serious about meeting a less than two degree (Celsius) warming target, you’ve got to do a lot of these new energies and put electricity as the main source of power for all sorts of things – vehicles, power generation, you name it,” Shell Canada president and country chair Michael Crothers said, citing a target in the 2015 Paris agreement on climate change. That process will take decades, Crothers said. Royal Dutch Shell, Shell Canada’s parent company, bought stakes in European wind power and electricity companies over the past 18 months. The global conglomerate is still figuring how best to structure itself as it takes positions in both new and traditional energy sources, Crothers said. Large oil sands companies like Shell and CNRL say they’re putting enough money into the research they’ll need to profit in a low carbon economy – for now. The price of oil and the oil sands’ projected growth will likely influence that amount. But Bouvier, the Scotia Capital analyst, said investors have preferred the oil sands send money back to them rather than boost R&D. But, “I would still hear them out if they had an idea that was well-costed,” Bouvier said. The next few years looks like business as usual, he said. Which means Alberta – and Canada – don’t have an easy replacement for the oil sands’ large contribution in jobs and GDP, said Verschuren, the CNRL board member. On flights between Toronto and her native Cape Breton, she often speaks to Nova Scotians who work in the oil sands. Closing the oil sands – the type of thing Kenney the would-be premier rails against – would bring disaster to their livelihoods, she said. Verschuren also has roots in the Netherlands, where she also visits, and has found conservation and efficiency are much more deeply held values there than in North America. That makes bridging the gap between economic growth and environmental sustainability much easier.